Healthy ways to deal with arthritis pain through exercise. Arthritis plagues 54.4million American adults and can make everyday tasks both challenging and painful to accomplish. There are more than 100 different types of arthritis-related diseases. The most common types include osteoarthritis, rheumatoid arthritis, psoriatic arthritis, fibromyalgia, and gout. The good news is, there are ways to cope with the chronic pain, including exercise. Workouts focused on movement and strength can help alleviate symptoms of arthritis. Read on to learn more about how to exercise with arthritis and what to consider before jumping into workouts. Physical movement increases strength and flexibility, making it an ideal option for treating arthritis. In addition, it reduces joint pain and helps to combat fatigue. “Exercise can help provide the area with a full range of motion and stimulation to the cartilage … triggering a beneficial response in the tissue. This response can help to mitigate symptoms and slow, or halt, the progression of arthritis,” says Dr. Beau Daniels, Director of Integrated Sports Medicine at Sports Academy. Exercise also helps to strengthen the muscles around joints which can alleviate some pain associated with movement and weight-bearing. You may also experience improved balance, better sleep, and increased energy. Stretching helps to lubricate the joints and enhance range of motion. The most beneficial types of stretches to weave into your routine include static and dynamic stretching. “Static stretching is low load, long duration positions that increase the length of the soft tissue (muscles and tendons). Static stretches are held [for] a minimum of 30 seconds and can be held upwards of a couple of minutes, if [you’re] extremely tight. The goal is to increase the flexibility of the tissue so that there is reduced compression into the joint. This stretch can slow the progression of arthritis. It creates more space in the joint so that you technically do not have as much wear and tear between the bones. This will also help with the pain,” shares Dr. Karena Wu, physical therapist and owner of ActiveCare Physical Therapy in both New York City and Mumbai. Dynamic stretching, also known as active stretching, is another suggested style of stretching. This helps to warm up the body and increase blood flow. “Dynamic stretching is movement based. [It] creates a stretch/lengthen and relax/shorten phase that increases blood flow into the tissue, thereby making it more pliable. This type of stretching is typically done in warm-ups but can be done to help reduce the perception of pain linked to arthritis. Because the end range of the soft tissue is not held for a prolonged period of time, it technically doesn’t truly increase the length of the tissues. It will reduce compression more in the short-term because the tissue is looser and warmer. Increasing fluid flow into the area reduces your perception of pain,” adds Dr. Wu. You can still achieve a solid workout without all the intensity. Consider low-impact workouts like water walking, swimming, or aquacise. The buoyancy of water exercises reduces stress on the joints and minimizes the pain. Water workouts also help improve range of motion and balance. 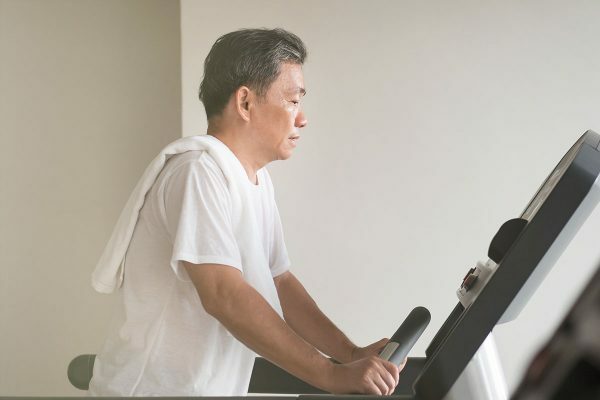 Depending on your soreness or stiffness, you can also try low-impact cardio machines such as the elliptical and rowing machine to build stamina and strength. “High-impact activities are not recommended with arthritis because of the ground reaction forces that increase the compressive load in the joint. [They] come up from the ground, and your body weight plus gravity comes down to meet it. This creates a force into any joint, but typically the weight bearing joints (spine, hips, knee, ankles). It ‘smashes’ the bone ends together, which will increase the irritation and the pain,” says Dr. Wu. Work the mind and the body. The ideal way to exercise with arthritis is to do workouts that make you feel good and help to reduce pain. “Activities that require a torque or pivoting motion, or quick stop and start motions, are also not recommended. The impact force from these motions increases the friction. [This] then increases irritation and pain from the bone ends moving more aggressively on each other,” Dr. Wu says. Incorporating a regular yoga practice is another great option to exercise with arthritis and get a mind and body workout. Recent studies confirm that those with various types of arthritis see an improved quality of life while following a regular yoga practice. In addition, yoga has helped correct joint flexibility and reduce pain. Arthritis doesn’t need to keep you from living a healthy and active lifestyle. Always ease into exercise with arthritis and be sure to talk to your doctor before starting any new fitness routine.